Nipper Pat Daly in his fighting prime. 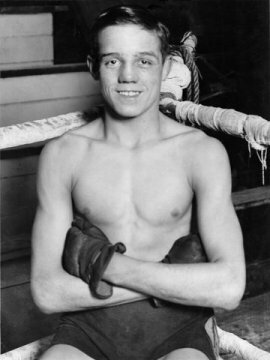 Nipper Pat Daly (real name Patrick Daley) received widespread acclaim as one of the biggest names in British boxing in the late 1920s and early 1930s. Some 80 years on, though largely forgotten, his ring achievements mark him out as arguably the most talented teenage boxer ever to lace on gloves. In his short but truly remarkable professional boxing career he defeated three British champions, a European champion and the reigning national champions of Italy, Germany and Belgium; not to mention a host of other top-class fighters. Typically conceding five to 10 years in age to his opponents, following a phenomenal run of victories, at age 16 he was ranked in the world's top 10 by America's The Ring magazine. Yet at 17 he was reluctantly forced to hang up his gloves for good. Although he retired from the game in 1931, Pat stayed in touch with the sport he loved and continued to train, spar and teach boxing for much of his life. In the late 1940s and early 1950s he ran his own gym in New North Road, Shoreditch, where he mostly coached amateurs but also managed and trained a few pros. After relocating south of the river, in the mid to late '50s he taught boxing evening classes at Peckham Manor School, while running his own Irish dance hall, also in Peckham. The purpose of this site is both to spread awareness of this great yet forgotten fighter, and hopefully, with the help of others, to learn more about Nipper Pat, his opponents and their times; and perhaps even get in touch with people who knew him, either in or out of boxing. If you have any information about my grandfather, Pat, any of his opponents (please see his record for a list of names), '20s or '30s British boxing or simply life in Marylebone before the war, I would love to hear from you and would be grateful for any information or recollections you can share. If you have photos, handbills, programmes, posters or similar material on Nipper Pat Daly, please also get in touch as I am happy to either trade boxing memorabilia, purchase, or exchange copies or scans. Contact me via email: alex at nipperpatdaly.co.uk (replace the 'at' with @). You can learn about Nipper Pat Daly's unique career, life and times in a new book, published by Pitch Publishing and featuring previously unpublished memoirs penned by Nipper Pat himself. Visit the book's Amazon page.